The Department of Public Works will continue curbside leaf collection in several Township neighborhoods next week. Please remember to rake your leaves to the curb ahead of collection date posted in your neighborhood. To aid in this process and give homeowners more flexibility with their leaf collection, free, 30-gallon paper leaf bags are still available for pickup in the Municipal Clerk's Office (Room 107) in Town Hall or at at the Department of Public Works (1 Perina Blvd.). The following neighborhoods are scheduled for collection this week; a second collection is tentatively set for the week of Dec. 9: Kenilworth, Windsor Park, Fox Hollow Woods, Kresson Woods, Brookfield, Old Orchard, Wexford Leas, Batesville, Hunt Tract, Wilderness Glen, Wilderness Acres. Please avoid parking cars in the street on scheduled leaf-collection dates, and be sure to remove branches, twigs and other debris from leaf piles to ensure they can be collected. For more information, including the full leaf collection schedule, click here, or call DPW at (856) 424-4422. 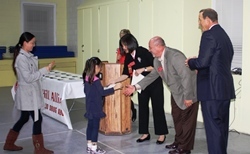 On Tuesday evening, Council members Susan Shin Angulo and Jim Bannar joined me to help congratulate and recognize the winners of the 2013 Red Ribbon Poster Contest, sponsored by the Cherry Hill Alliance on Drug and Alcohol Abuse. The contest, which is open every year to students in grades K-12, invites participants to design posters based on that year's anti-drug theme. This year's theme, "Life is a Journey," inspired a variety of very creative and impressive posters and messages. Thank you to all the children who participated, and congratulations to our winners! Last Sunday, our community kicked off the yearlong celebration leading up to the 2014 JCC Maccabi Games at the Katz JCC. Council President Dave Fleisher and Council members Susan Shin Angulo, Jim Bannar and Melinda Kane joined in the kickoff parade early Sunday morning, led by former Maccabi athletes and coaches and, of course, the Macca-bee mascot! 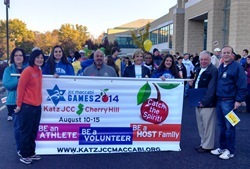 The parade, held along with the Cherry Hill Volvo 5K Road Race, began the yearlong celebration of the JCC Maccabi Games, which will be hosted in Cherry Hill this year, from Aug. 10-15. The Olympic-style athletic competition is the largest annual gathering of Jewish teens in the world, and will attract more than 1,000 young athletes, as well as thousands of spectators, into our area. PSE&G has begun underground infrastructure work in Cherry Hill that is expected to last through mid-December. As part of this project, PSE&G will be rerouting an existing underground circuit on Cuthbert Boulevard at Hampton Road, into the PSE&G Cuthbert Boulevard Substation. Work will be conducted 24 hours a day, 7 days a week for the next several weeks. Police will provide traffic assistance to minimize the impact to traffic on both Cuthbert Boulevard and Hampton Road; however, delays are possible. Electric and gas service to PSE&G customers will remain unaffected during construction. This infrastructure upgrade will help PSE&G continue to provide safe, reliable electric service to area residents and businesses. Residents with questions about this project should call PSE&G's toll-free hotline at (866) 507-5961. Tuesday is Election Day in New Jersey; polls open 6 a.m. to 8 p.m.
Tuesday is Election Day in New Jersey, and locally there are a number of state and local races on the ballot. If you are registered to vote, polls are open from 6 a.m. to 8 p.m. Click here for a sample ballot and other information on the 2013 General Election; click here for voting information; click here to find your polling location. Last Sunday, several Township Council members started celebrating Halloween a little early. 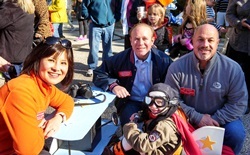 Council President Dave Fleisher, along with Councilwoman Susan Shin Angulo and Councilman Jim Bannar, spent last Sunday afternoon with families in Colwick as they celebrated their annual neighborhood Halloween parade. Our Council members cheered on dozens of children as they showed off their festive attire, and served as judges in the Halloween costume contest following the parade. The weather was beautiful, and a wonderful time was had by all. Happy Halloween! Cherry Hill Township is looking for part-time crossing guards to temporarily fill vacancies. Crossing guards work assigned school posts for morning and afternoon sessions during the school year. Applicants can click here to download an application online, or pick up an application packet at the Cherry Hill Police Department Records window at the Municipal Building, 820 Mercer St. 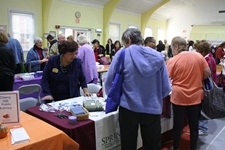 Hundreds of Township seniors came out to the Municipal Building on Monday afternoon to enjoy some free food, mingle with friends and neighbors, meet with Township representatives, and receive information on the variety of programs, services, activities, social events and organizations geared toward local residents age 55 and up. 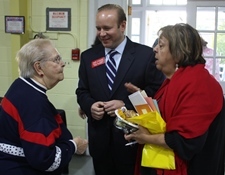 It was a great opportunity for Council and I to see some familiar faces, and make new acquaintances, as well. Thank you to all who came out to make this event a success, and a special thanks to our sponsors at Brandywine Senior Living and Wawa. Visiting neighborhood events is one of the best parts of our jobs as elected officials. Let us know if you have something going on in your area, by calling my office at (856) 488-7878, or e-mailing ddovey@chtownship.com. Seating still remains for our Disney Classics Children's Concert, featuring cartoons and live music, at 11 a.m. this Saturday, Nov. 2, at the newly renovated Croft Farm Arts Center. Musicians Luba Agranovsky, Dmitri Kasyuk, Courtney Quinn and Jacob Berko will perform pieces from Disney favorites such as Beauty and the Beast, the Little Mermaid, the Lion King, Jungle Book and many more, as part of this interactive performance ideal for children ages 3 to 6. Tickets are $5 each, or 4 for $15. Doors open at 10:30 a.m. This event is sponsored by Black Forest Cabinetry, Kempo Family Fitness Center, The Goddard School, the New Jersey School of Music, and Sweet & Sassy. On Monday night, Council and I honored the staff members and executive board from the Kingston Estates Swim Club for their dedication to maintaining a place that is safe and healthy for all its patrons. 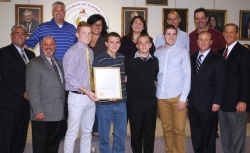 Roughly two dozen club staff members, including several young lifeguards and their families, came out to Monday's Township Council meeting to accept a special proclamation recognizing their efforts. The award stemmed from an instance this summer that required four of the club's teenage lifeguards to put their training to use to rescue a swimmer who had become distressed. It was our honor to recognize the lifeguards -- Alex King, Daniel Walsh, Kevin Quinn and Jeffrey Nixon -- for their quick thinking and life-saving actions, and to thank the entire swim club organization for promoting a culture of safety among its members and staff. The Cherry Hill Public Library will host a community blood drive for the American Red Cross from 2:30 to 7:30 this Monday, Nov. 4, in the library's lower-level conference center, 1100 N. Kings Hwy. Click here to schedule your appointment online; click here to check eligibility requirements. Donate blood, and you can help save a life! The Department of Public Works will continue curbside leaf collection in several Township neighborhoods next week. Please remember to rake your leaves to the curb ahead of collection date posted in your neighborhood. To aid in this process and give homeowners more flexibility with their leaf collection, free, 30-gallon paper leaf bags are still available for pickup in the Municipal Clerk's Office (Room 107) in Town Hall or at at the Department of Public Works (1 Perina Blvd.). The following neighborhoods are scheduled for collection this week; a second collection is tentatively set for the week of Dec. 9: Kenilworth, Windsor Park, Fox Hollow Woods, Kresson Woods, Brookfield, Old Orchard, Wexford Leas, Batesville, Hunt Tract, Wilderness Glen, Wilderness Acres. Please avoid parking cars in the street on scheduled leaf-collection dates, and be sure to remove branches, twigs and other debris from leaf piles to ensure they can be collected. For more information, including the full leaf collection schedule, click here [http://www.cherryhill-nj.com/CivicAlerts.aspx?AID=402] , or call DPW at (856) 424-4422. PSE&G Cuthbert Boulevard Substation. Work will be conducted 24 hours a day, 7 days a week for the next several weeks. Police will provide traffic assistance to minimize the impact to traffic on both Cuthbert Boulevard and Hampton Road; however, delays are possible. Electric and gas service to PSE&G customers will remain unaffected during construction. This infrastructure upgrade will help PSE&G continue to provide safe, reliable electric service to area residents and businesses. Residents with questions about this project should call PSE&G's toll-free hotline at (866) 507-5961. Tuesday is Election Day in New Jersey, and locally there are a number of state and local races on the ballot. If you are registered to vote, polls are open from 6 a.m. to 8 p.m. Click here [http://www.camdencounty.com/clerk] for a sample ballot and other information on the 2013 General Election; click here [http://www.camdencounty.com/government/voter-information/superintendent-elections] for voting information; click here [https://voter.njsvrs.com/elections/polling-lookup.html] to find your polling location. Cherry Hill Township is looking for part-time crossing guards to temporarily fill vacancies. Crossing guards work assigned school posts for morning and afternoon sessions during the school year. Applicants can click here [http://www.cherryhill-nj.com/admin/%20http://www.cherryhill-nj.com/jobs.aspx] to download an application online, or pick up an application packet at the Cherry Hill Police Department Records window at the Municipal Building, 820 Mercer St.
have something going on in your area, by calling my office at (856) 488-7878, or e-mailing ddovey@chtownship.com. newly renovated Croft Farm Arts Center. Musicians Luba Agranovsky, Dmitri Kasyuk, Courtney Quinn and Jacob Berko will perform pieces from Disney favorites such as Beauty and the Beast, the Little Mermaid, the Lion King, Jungle Book and many more, as part of this interactive performance ideal for children ages 3 to 6. Tickets are $5 each, or 4 for $15. Doors open at 10:30 a.m. This event is sponsored by Black Forest Cabinetry, Kempo Family Fitness Center, The Goddard School, the New Jersey School of Music, and Sweet & Sassy. The Cherry Hill Public Library will host a community blood drive for the American Red Cross from 2:30 to 7:30 this Monday, Nov. 4, in the library's lower-level conference center, 1100 N. Kings Hwy. Click here [http://www.redcrossblood.org/make-donation-sponsor?date[min][date]=&date[max][date]=&field_sponsor_code_value=cherry%20hill%20library] to schedule your appointment online; click here [http://www.redcrossblood.org/donating-blood/eligibility-requirements] to check eligibility requirements. Donate blood, and you can help save a life!